We’ve previously seen a Lamborghini Huracan get the better of a Corvette ZR1 in both a roll race and from a dig. 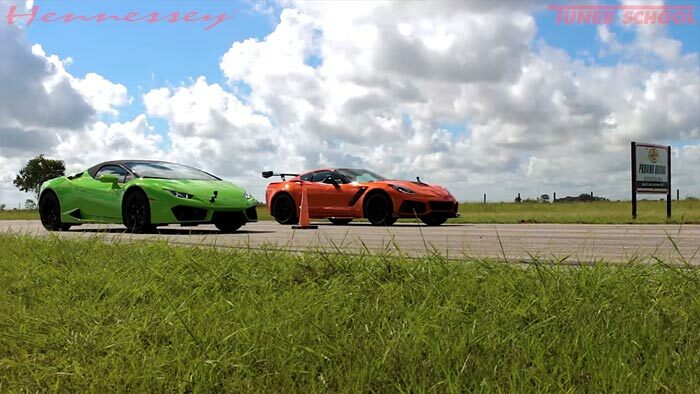 But this time, the 2019 Corvette ZR1 takes down the Italian bull on the Hennessey Performance drag strip. While baseline testing this stock ZR1 in anticipation of its HPE1200 upgrade, a Lamborghini Huracan stopped by for a little comparison. Huracan courtesy of ecurie25 Supercar Club. And the big wing on the Corvette slowed it down!